Provide comfort for the family of Judith Beaudoin with a meaningful gesture of sympathy. MASSENA – Judith I. Beaudoin, 77, a longtime resident of Liberty Avenue, unexpectedly passed away Wednesday afternoon, March 27, 2019 in the emergency room at Massena Memorial Hospital. Judith was born April 4, 1941 in Norfolk, the daughter of the late Iva Jacobs. On April 6, 1959, she married Antoine J. Beaudoin in Massena. He predeceased her in May 1997. Judith was a homemaker and the best mother, dedicating her life to raising her family. 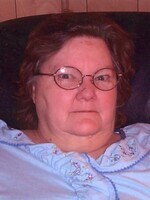 She was an avid Bingo player, enjoyed painting and doing puzzles. She was a huge Elvis fan, and even visited Grace Land. She loved her cat Callie, but most of all, she treasured her time with loved ones. She is survived by her four children, Gary Beaudoin of Hopkinton; James Beaudoin of Massena; Leonard and Kim Beaudoin of Massena; and Kenneth and Christine Beaudoin of North Carolina; and one step-daughter, Nadine; her grandchildren, James, John, Joseph, Jacob, Jacqueline, Denise, Daniel, Kevin, Jessica, Jennifer, Charisse, Natale and Andrea; her great grandchildren, Emily, Eli, Joshua, Ryan, Tyler, Jasmine, Jaxson, Aurora, NovaLee, Luna, and Benjamin; and her sister Kim. Besides her mother, and husband, Judith was predeceased by an infant sister and her brother, Richard. Friends may call at the Donaldson Funeral Home, Monday 4-7 PM. A graveside service will be held in the spring at Calvary Cemetery, Massena. Memorial donations may be made in Judith’s memory to the St. Regis Nursing Home Activities Fund or the Massena Memorial Hospital Foundation. 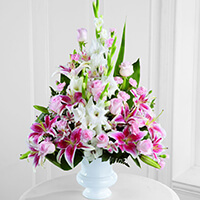 To send flowers in memory of Judith I Beaudoin (Miller), please visit our Heartfelt Sympathies Store. To be held in the spring at a time to be announced. Donations are being accepted for: MASSENA MEMORIAL HOSPITAL FOUNDATION INC.
James, John, Joseph Jacob, Abby & Erin sent flowers to the family of Judith I Beaudoin (Miller). So sorry to hear of the loss of your Mom. She was a wonderful person. I am hoping you will find comfort in all the many special memories I know you had of her. Our thoughts and prayers are with you. Grandma, Know that you were loved & will be missed! James, John, Joseph Jacob, Abby & Erin purchased the The FTD Precious Peace Arrangement for the family of Judith Beaudoin. I'm very sorry to hear the loss of Mrs.Judith.It is very difficult to loss our dear loved ones in death. But we have a great hope from our heavenly father.In his word the bible says that “There is going to be a resurrection.”—Acts 24:15 The Bible often compares death to sleep. (John 11:11-14) (“O that in the Grave you would conceal me, That you would hide me until your anger passes by, That you would set a time limit for me and remember me! If a man dies, can he live again? I will wait all the days of my compulsory service Until my relief comes. You will call, and I will answer you. You will long for the work of your hand") Job 14:13-15 God can awaken the dead, just as we can awaken a person from sleep.The Bible records several resurrections, thus giving us a solid basis for believing that the dead will be raised up.​—1 Kings 17:17-24; Luke 7:11-17; John 11:39-44. I hope this promise would help you to have some comfort and hope in this difficult time.